The first year I was in Ireland I made the big mistake of not growing ‘Queens’. I steered well away from them, thinking that anything ‘royal’ would be frowned upon in the Republic, but I was wrong. Everyone seems to look forward to the first ‘Queens’ appearing in the shops and for sale at roadside stands and ‘British Queens’ as they are more accurately called, are the favourite early spud here even though they are officially a second early. They are an old variety that is very floury and they are also often proudly described as ‘balls of flour’. 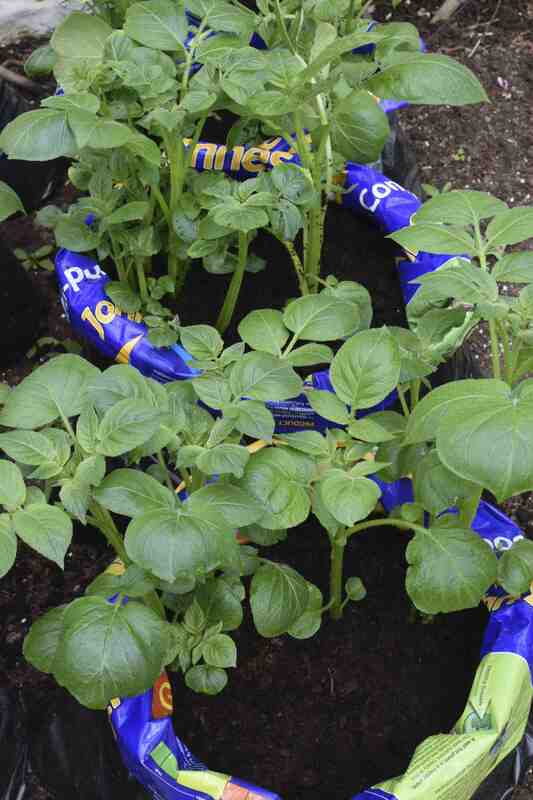 Part of my reticence in planting them was that, unlike most in Ireland, I prefer waxy spuds but this year I aimed to get some really early ‘Queens’ and planted them, in early March, in old compost sacks. They were kept in the (unheated) greenhouse and this was them last week, the bag at the front just before I had rolled up the sides and added more compost. By now they need this repeated because the warm weather and sun is helping them grow really fast. I am hoping for a good crop by the end of May which will be at least ten weeks after planting – fingers crossed.